Hinsdale Central senior Shalni Sundram grew up loving jigsaw puzzles. She sought the most difficult—at least 1,000 pieces—and eagerly solved them with the pieces upside down. Last year, Sundram turned that focus toward solving a void at the high school. Recent surveys document the ratio of engineering professionals as roughly 80 percent male to 20 percent female. So, she founded the Women in Engineering Club to inform and motivate girls toward considering that path for their careers. The club celebrated its one-year anniversary in January. At least 15 members attend the bi-weekly Thursday afterschool meetings in the chemistry room of teacher Julie Baker, the club’s co-sponsor with Marvin Breig. Adding to the more than 90 clubs at Hinsdale Central required an entire semester and overcoming a couple of hurdles. To get the club off the ground, Sundram first needed a petition signed by students. Next was persuading Hinsdale Central Activities Director Sally Phillip and the student committee the club was necessary—especially because there already is an Engineering Club that meets every Thursday. To convince Phillip, and motivate other students to sign her petition, Sundram emphasized the awareness and motivational aspects her club would provide as opposed to the more hands-on emphasis of the other club. And yes, boys were welcome to attend. “It was a little intimidating at first. I definitely had to step outside my comfort zone because it’s so much easier to join a club than to create your own,” Sundram says. “After I saw all of those 50 petition signatures, it felt really good and gave me that validation.” And, the new club received a highly positive response. Many of the science department faculty members began attending, along with students, who continue to attend. “They’ve been really enthusiastic,” says Sundram. As the club’s first president, Sundram develops presentations with facts, websites, and videos about different engineering fields. She’s coordinated guest speakers such as a Caterpillar mechanical engineer, an electrical engineer, and older sister Shaila, 22, who has an industrial engineering degree from Purdue University. One friend who first attended the club to support Sundram’s efforts has switched to an engineering major. Sundram attributes her interest and motivation to establish the club, in part, to her older siblings who are engineering role models. Older brother Shiv, 25, majored in computer science and applied math at California-Berkeley. Further inspiration and confidence came after Sundram attended an all-girls University of Illinois engineering camp in the summer of 2017. Encouraged by Baker to attend, Sundram was placed in the computer science section. Her concern for the gender gap in engineering has Sundram also working on a national survey with a market research company to analyze why more women don’t pursue engineering-based careers. She hopes it can be published. Sundram’s attention to detail and discipline also shows through her playing the piano for 13 years and clarinet since fifth-grade band. A clarinet player for the school orchestra, she limits her piano playing to recitals because she does not want competition to taint the love for her favorite outlet. “Whenever I have free time, I play piano. My mom and dad think that it’s a clever tactic to avoid my homework,” she laughs. 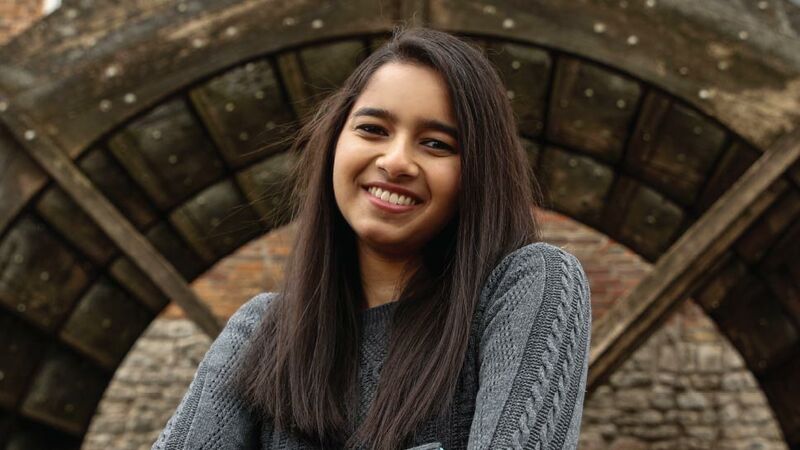 Now leaning toward majoring in computer science with more than 10 schools under consideration, Sundram is proud of her decision to establish the Women in Engineering Club.